At the end of the last century, the so-called “new technologies” started to question the process of design, production, sales and consumption through a radical change, which today re-defi nes many concepts both in industry and every-day life. 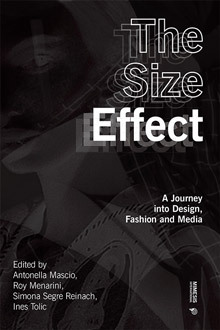 The notion of “size” – a cross-cutting term in the cultural and creative sector – has gone through a phase of crisis from which it is now re-emerging, enriched with new meanings and possibilities. To redefine this complex term, the authors of the book have observed the path of audiovisual products and social media, fashion, everyday objects, architectures and cities, and identified in each of these fields elements of continuity, breaking points with the past as well as future alternatives. In this collection of essays, the authors adopt an interdisciplinary approach overcoming the boundaries of their discipline. Through different perspectives this volume presents and develops new paradigms that explain the complexities of the contemporary era and its new “sizes”. Antonella Mascio is Assistant Professor in Sociology of Culture and Communication at the University of Bologna. Roy Menarini is Associate Professor in Cinema, Photography and Television at the University of Bologna. Simona Segre Reinach is Associate Professor in Sociology and Fashion Studies at the University of Bologna. Ines Tolic is Assistant Professor in History of Architecture at the University of Bologna.